Worcester Cathedral is an Anglican cathedral in Worcester, England; situated on a bank overlooking the River Severn. 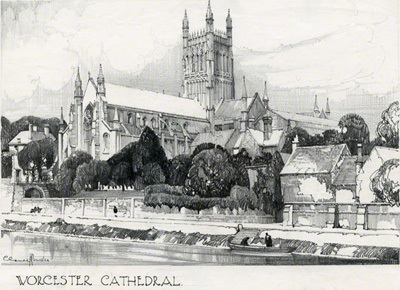 Claude Buckle has made this pencil drawing of the cathedral from the same angle as his Worcester poster which was painted two years earlier. The view is looking across the river in a north easterly direction. The Cathedral was founded in 680 AD. Built between 1084 and 1504, Worcester Cathedral represents every style of English architecture from Norman to Perpendicular Gothic. It is famous for its Norman crypt and unique chapter house, its unusual Transitional Gothic bays, its fine woodwork and its "exquisite" central tower which is of particularly fine proportion.